Published in the Dover Express, 23 January, 1981. "Opposite the Duke’s gallery, at the lower end of the pavilion was the ladles’ gallery, offering an accommodation for 500 persons; and above this, was an orchestra capable of bolding 80 performers. Above the ladles' gallery, on each side of the orchestra, were two elegant slips of Gobellnes tapestry, from the life of Alexander. The armorial bearings on the ladles’ gallery, were those of the Lords Warden from the reign of Henry III to the time of Richard II. Over the orchestra were placed coats of arms of the Wardens from Richard II to Edward IV. Around the building, In various places, were distributed the Lords Warden’s arms from the last-mentioned King down to the present Illustrious Duke. In many parts of the building were also arranged crests of the leading Kentish families. Besides these various decorations, a tasteful arrangement of muskets and pistols, with several smaller arms, were placed upon the principal columns, which were furnished by R. H. Jenkinson, Esq the Deputy Governor of Dover Castle. The chandeliers were eleven In number, and were prepared for the occasion by a London artist, and burned 136 lights. Three of these splendid chandeliers were suspended from the centre, and the other eight depended from the ceiling of the two aisles." Between the roof and the side walls of the upper part of the nave, were beautiful transparencies, or window lights, executed by the artist, Mr William Burgess, a native of Canterbury whose name is associated with numerous engravings of old Dover including one of the Ball held In the Wellington Pavilion on 5th September, 1439. They consisted of the arms of the following places, flanked by whole-length figures. On the left side of the ladies’ gallery were placed MAIDSTONE—-A Warden and a Court Jester; CANTERBURY—Henry II and Edward the Black Prince; SUSSEX—An Archer and a Knight Templar; HASTINGS—Richard, Earl of Warwick, and an Archer; ROCHESTER—Sir Oliver de Ingham and Edward I. On the right of the ladles’ gallery; SANDWICH—George Boleyn and Sir T. Erping-ham; ROMNEY—Hubert de Husato and William Lord Latimer; KENT—Godwin, Earl of Kent, and Henry III; HYTHE—Sir Hugh Burdolfe, and William, Earl of Pembroke; DOVER—Sir Rhys ap Thomas; and Sir George Neville, Lord Abergavenny. Over the Duke's gallery the centre piece consisted of his Grace’s arms, on each side of which was a collection of weapons, and the badges of the regiments of which he is the colonel, with two knights in the act of tilting. On the day of the banquet six steamboats arrived from Ramsgate and Margate bringing nearly 2,000 passengers to witness the festivities and another steamer from Rye brought another large party, while the Hastings amateur band gave concerts on the pier. As the hour announced for dinner approached, the streets and avenues leading to the Priory Meadow were crowded with well-dressed ladies and gentlemen. Shortly before the arrival of the Duke, a guard of honour of the 27th (Inn is killing) Regt under the command of Capt. Smith, who was severely wounded at Waterloo, marched from the Castle to the Maison Dieu. A few minutes before five the Duke, in his Lord Warden's uniform, was seen approaching from Walmer in his phaeton and pair. He drove through the streets, and was received at every step by the hearty cheers of thousands He very graciously acknowledged their greetings, and alighted at the Maison Dieu. The booming of the guns from the Artillery at the Heights, gave to the company in the pavilion, already nearly seated, intimation that the illustrious guest was within sight. The bells of the churches sent forth their merry and pealing sounds; the bustle and interest which had marked the features of the throng, from the moment of their entering the pavilion, assumed a more intense aspect; and as each report succeeded the whole amphitheatre presented a mass of human beings. The streets, which had been crowded the whole morning, were now almost impassable. Carriages containing the fashion and beauty of "England's Pair," whirled along, and peers decorated with orders and ribands, and veteran heroes, many of whom had shared In the perils and glories of the great chieftain, attired in their showy and costly uniforms, rapidly passed through the admiring crowds to obtain their seats ere the Duke appeared at the festal board. The Duke was received at the Maison Dieu by the Mayor and Recorder of Dover, and conducted by those personages through a double line of noblemen and gentlemen, assembled to welcome his Grace, who was received by a guard of honour, from the Twenty-seventh Inniskilling Regiment which was specially detained in the Garrison, by order of Lord Hill, as an appropriate National guard, having been by a singular coincidence, the only Irish Infantry Regiment at Waterloo, where they suffered to a greater extent than any other Regiment engaged. On his arrival his Grace was saluted by 19 guns from the Heights. The troops of the 90th depot were also in attendance, and lined the approaches through Biggin Street. At the expiration of a few minutes the arrival, of his Grace at the pavilion was announced. Every one rose from his place and no sooner did the Speaker, who headed the procession, make his entre, than the clapping of hands and shouts from all quarters made the roof re-echo. In fact the cheering did not stop until a trumpet sounded for silence for the toastmaster. The Duke of Wellington gave two speeches in responding to toasts, a third in proposing a toast himself to the chairman and Speaker of the Cinque Ports, and also proposed the concluding toast to the health of the ladies. He then left amid deafening applause. The Dover Telegraph recorded that the town presented a most animated appearance throughout the day, being thronged not only with the carriages of the nobility and gentry, but likewise the more humble conveyances of the people from the surrounding villages.“ In the evening there were displays of fireworks on the sea front, to the rear of the bathing machines, watched by a crowd estimated at between 3,000 and 4,000, and from the Royal George steamer in the Bay. About this banquet there is a little history, which was the gossip of the inner circle at the time, but was not then made public. Mr. E. P. Thompson, the Mayor of Dover, who was Chairman of the Banquet Committee, not being much of a speaker, wrote In advance to Lord Brougham, who had accepted an invitation, asking him to propose the Duke of Wellington’s health. Brougham, who never neglected an opportunity of talking, agreed to the request, but when it became known to the Earl of Guilford, who was then the leading man in the district, he was much offended that the request had not been made to him. As soon as Lord Brougham arrived in Dover, the Mayor sought to set matters right by asking him to allow the Earl of Guilford to propose the toast, but Brougham said it could not be, for he had not only written his speech beforehand, but had sent it to the newspapers to be published! The consequence was that the Earl of Guilford absented himself from the banquet, and was only pacified by the Duke of Wellington calling on him at Waldershare. The Duke told him the story of Brougham having written out his speech beforehand and sent it to the papers, which so amused the Earl that he entirely forgot his grievance. The absence of the Congregational — now United Reformed — Church dates this roof-top view across High Street to the Castle as being prior to 1903. The church, the site of which is to the right of this picture, was in the process of being built in that year and was not opened until 1904. The photograph, printed from a glass negative 81' x 61", was probably taken in the 1890s. In the centre foreground are the flat-roofed properties of Victoria Crescent with the Royal Victoria Hospital, opened in 1851, opposite. 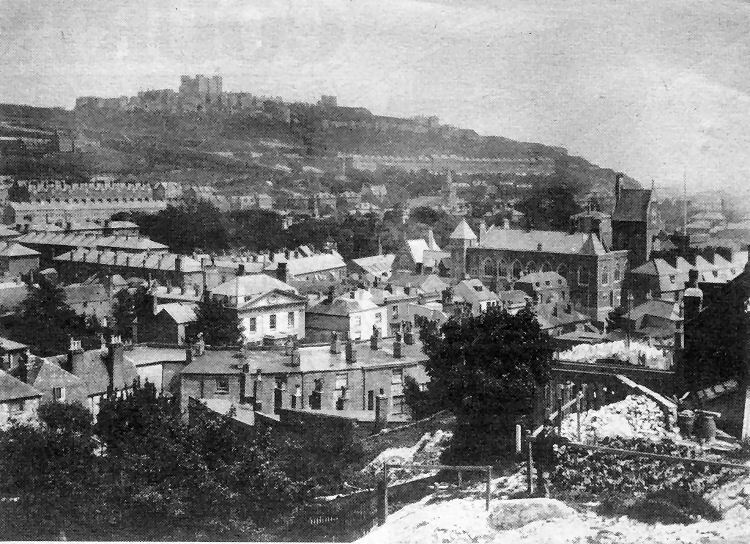 On the slopes below the Castle are the long terraced blocks of Harold Street and Leyburne Road, now demolished, and Victoria Park. Below the latter is the New St James’ Church, which escaped relatively undamaged during the Hitler war but was declared redundant in 1946 and subsequently demolished.